I have read this forgotten Christmas classic to 2nd and 3rd graders over the past two weeks, and kids and teachers have been loving this goosey love story. Since my mother used to read it to me when I was little, I feel like reading this book aloud makes Christmas real. A terrific Christmas read aloud for the 2nd/3rd grade set, though twice I had to stop and explain "gayest" in the context used in the book means festive and happy (curse older siblings). Duvoisin's illustrations and story are a perfect blend of Christmas love and silliness. This is a sweet story of devotion between two geese and the lengths that little Petunia will go to free her man (I mean, gander.) Our girls thought it was a nice story, and it's perfect for Christmastime. Mommy says: We loved this book so much we made Mommy and Daddy read it twice. I most especially loved the illustration. Petunia, a pet goose, is walking in the snow when she meets Charles, a handsome gander. Charles is especially handsome as he is being fattened for Christmas dinner by the farmer next door. How can Petunia save her dream of being with Charles? Dressing as Santa Claus, Petunia creates unique items to sell. Will her scheme work? This book, released in 1952, continues to be a holiday classic. The original illustrations and simply hilarious and original plot remind us of its Caldecott Medal status. Hooray for the little guy - or goose - in this case. What a Christmas it will be for Petunia! 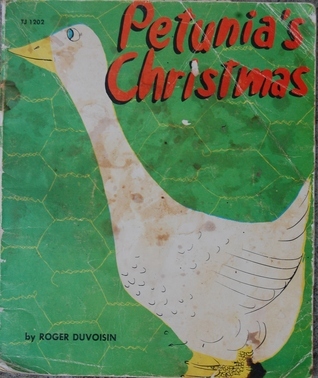 When Petunia meets Charles, a handsome gander at a neighboring farm, she determines to set him free so they can be together--and so Charles won't be someone's Christmas dinner! I didn't enjoy this one as much as the original Petunia story, where the silly goose learns to read, but I did get a kick out of her dragon disguise. And again, adore this author. This one was a delight. Wish I owned it. I skimmed it more than I read it, but it seems like one of those classic heartwarming children's stories of old. Clever, creative Petunia saves her man! So grateful to have inherited this book. We read it as a family every Christmas season. Missed this one as a classic. Nothing better than goose love. Could consider buying. Definitely an intriguing premise -- Petunia is kept as a pet, but meets a gander from a neighboring farm who is being raised as a meat goose -- with soft, calming pencil illustrations throughout. Roger Duvoisin - Roger Antoine Duvoisin (August 28, 1900 – June 1980) was a Swiss-born American writer and illustrator, best known for children's picture books. He won the 1948 Caldecott Medal for picture books and in 1968 he was a highly commended runner-up for the biennial, international Hans Christian Andersen Award for children's illustrators.